This is where the City by the Bay meets the Pacific Ocean. 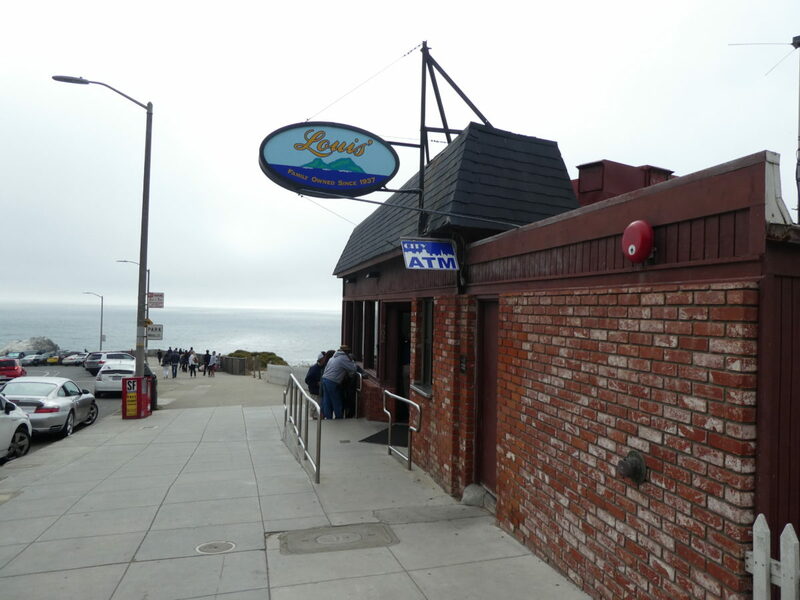 Generations of San Franciscans have come here to frolic by the water. 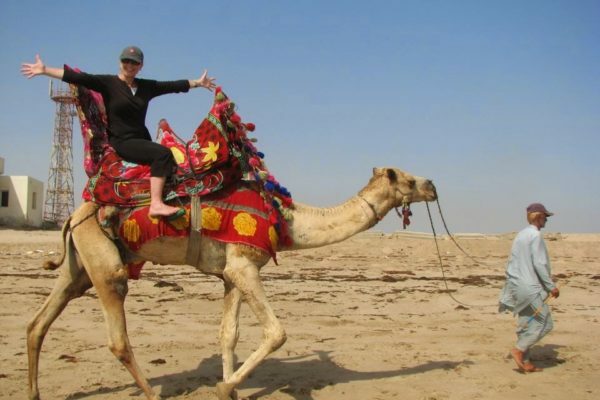 You should come here to soak up the history and enjoy the splendid views on a sunny day. 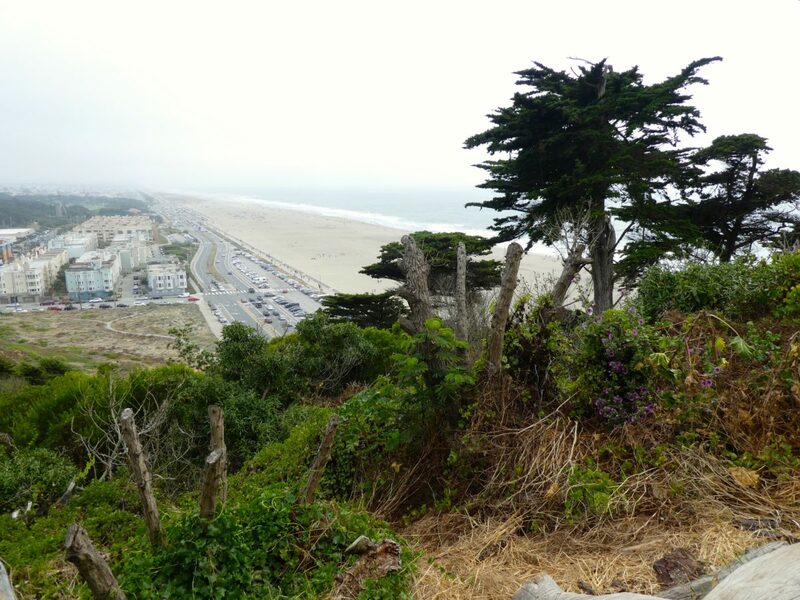 A day in Sutro Heights is a refreshing break from busy downtown streets in San Francisco. 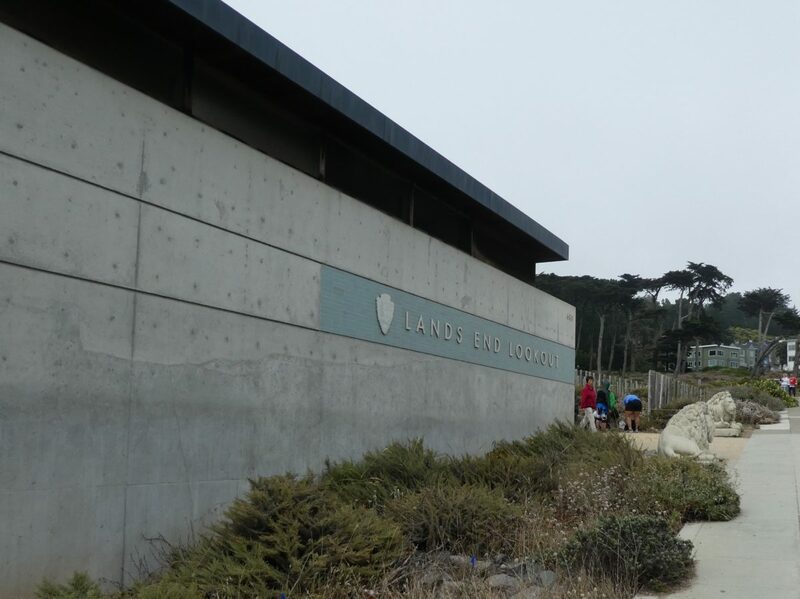 Part of the Golden Gate National Recreation Area, the Land’s End Lookout visitors’ center is operated by the National Park Service. It has a helpful website for planning your visit. There’s even a coffee bar if you need to fortify yourself with a shot of caffeine before hiking the area. 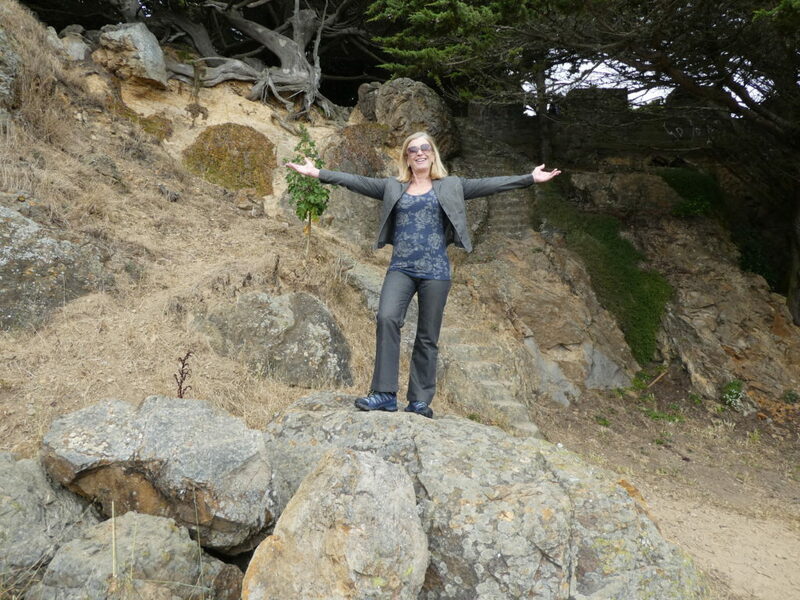 Wear sensible to negotiate the path down to the Sutro Baths. The lookout point is accessible to those with mobility issues. 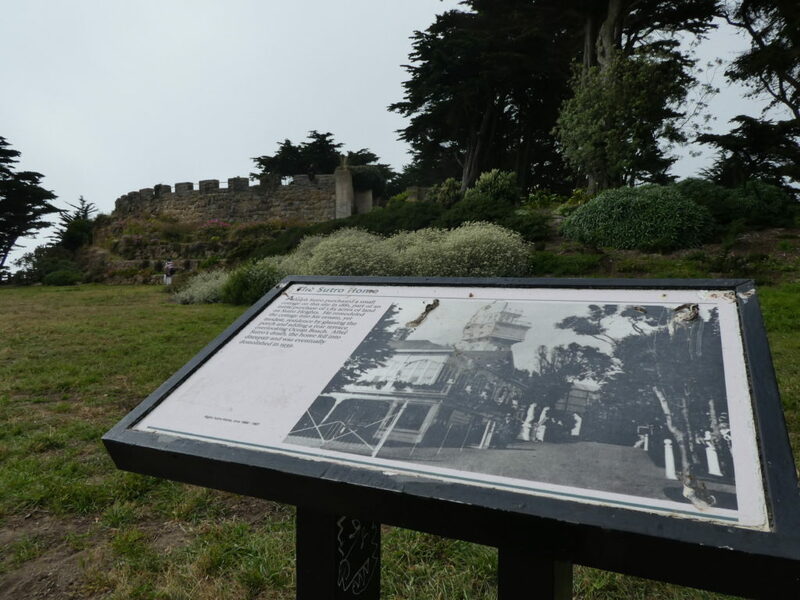 Only ruins remain of Adolph Sutro’s dream to provide a healthy seaside swimming facility for city residents. The self-made millionaire opened a grand 3-acre swimming pavilion with seven pools, filled by high tides from the Pacific Ocean and heated to different temperatures. Visitors could enjoy springboards, slides and over 500 dressing rooms. 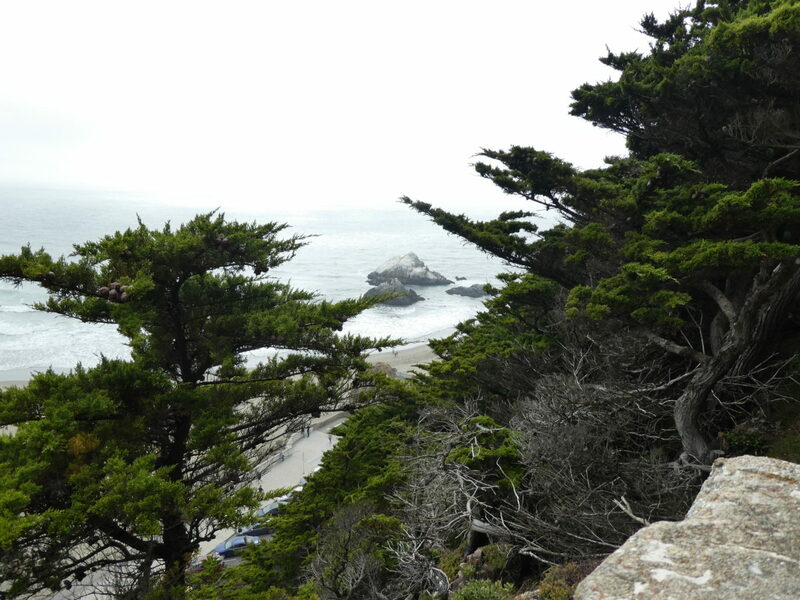 View what’s left of the Sutro baths from the cliffs above, or walk down the path. 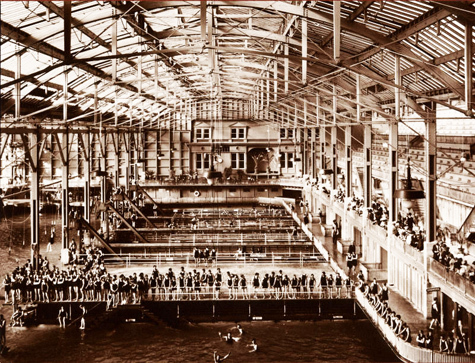 At the time of its opening in 1896, Sutro Baths was virtually unrivaled in the United States in its scale, technical achievement, and modernity. The glory days of the Sutro Baths. 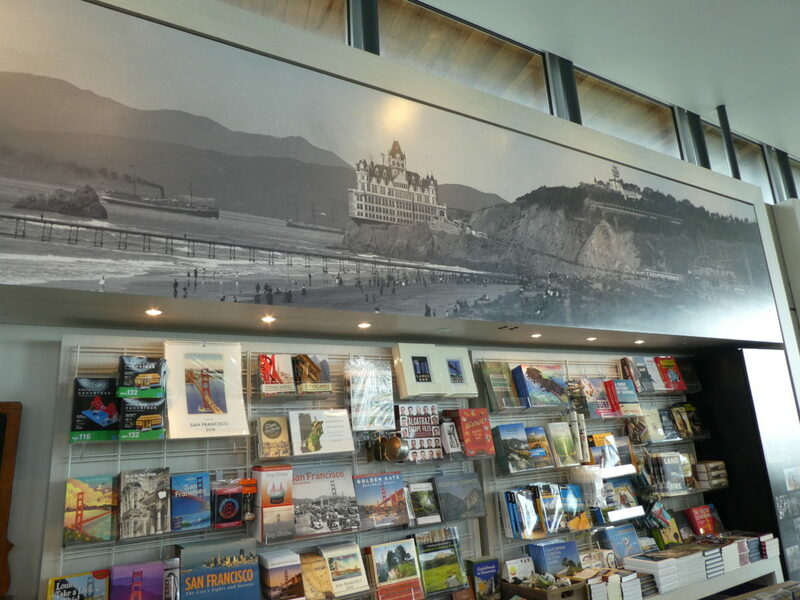 Photo courtesy National Park Service and Cliff House. 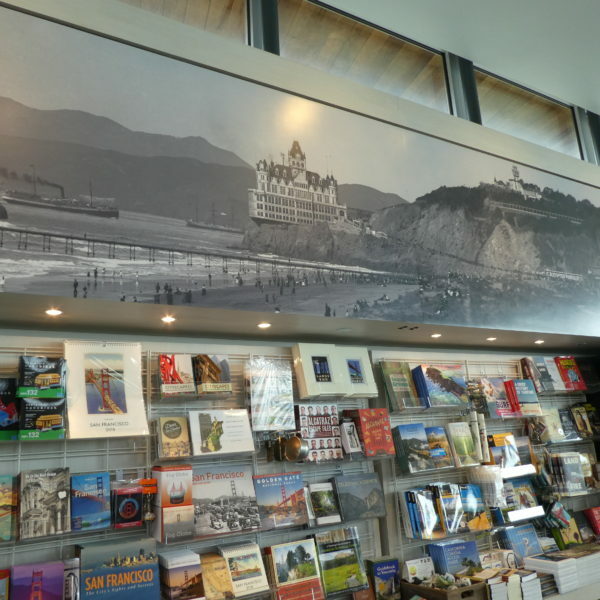 As you walk around the pools and look at the historic photos you can only imagine how much fun it would have been to swim here — it’s no longer allowed. 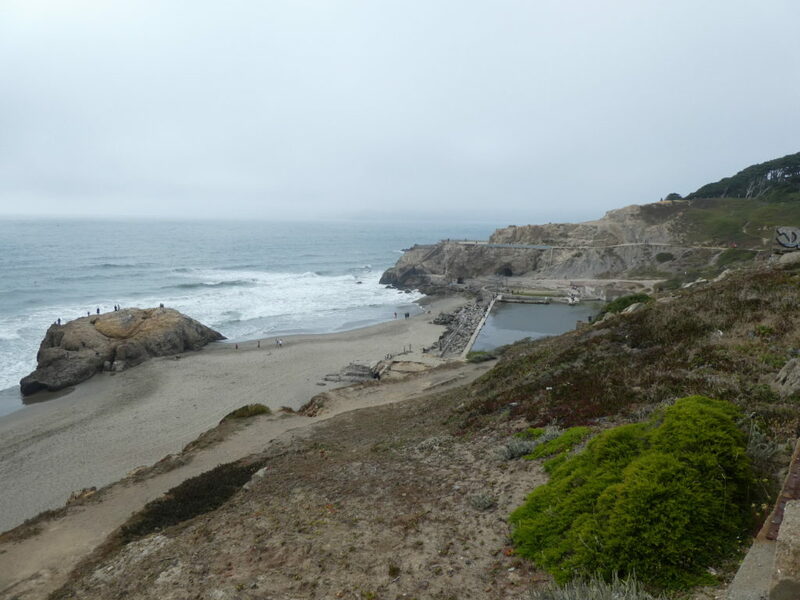 The Sutro Baths fell into disrepair during the Great Depression of the 1930s and were demolished by fire and development plans in the 1960s before the Park Service took over. Remains of a bygone era in the Sutra Historic District park. Sadly, it may seem a bit shabby in places due to federal budget issues. 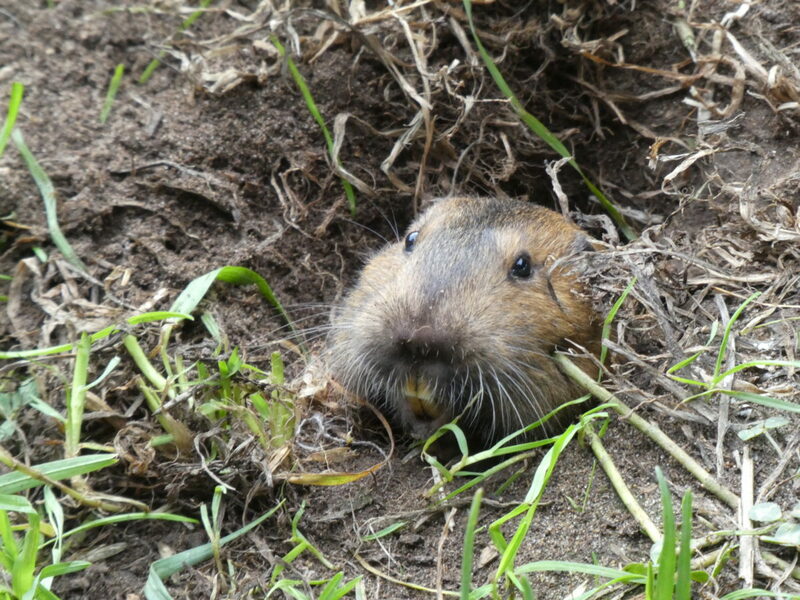 Still, it’s worth your time for the views and a surprising amount of wildlife. 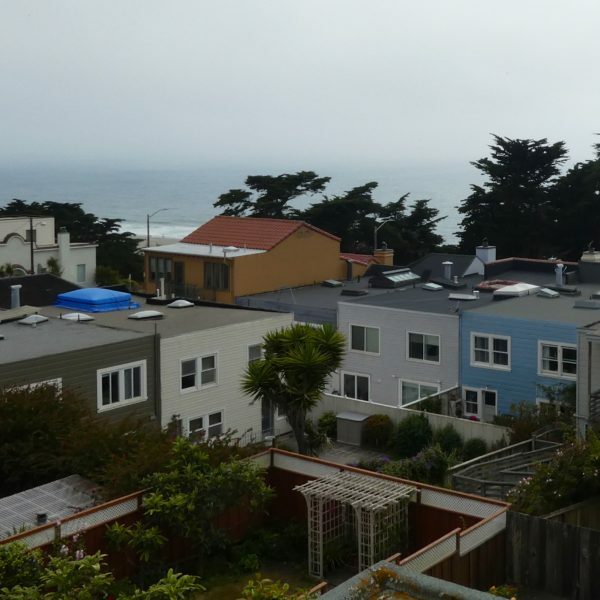 Although you are on the edge of one of the world’s great cities, Sutro Heights feels like a small seaside village of its own. 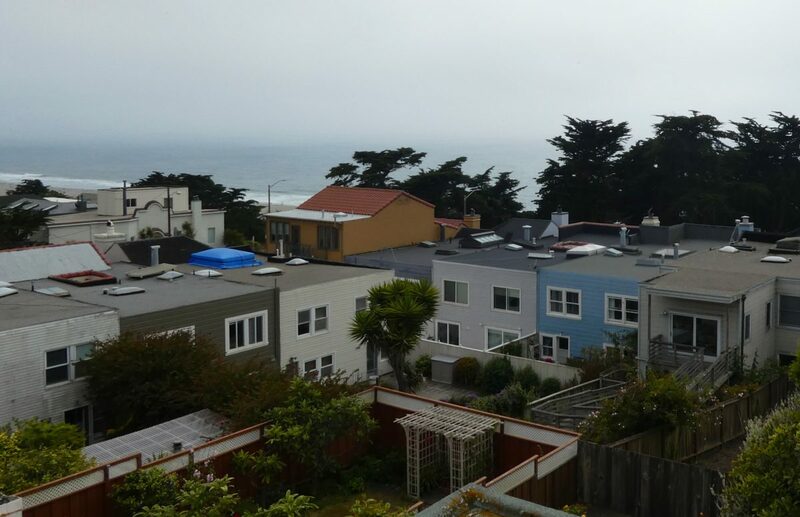 It is a subset of the sought-after Outer Richmond District, and some of the homes have been in the same family since they were built in the 1930s. 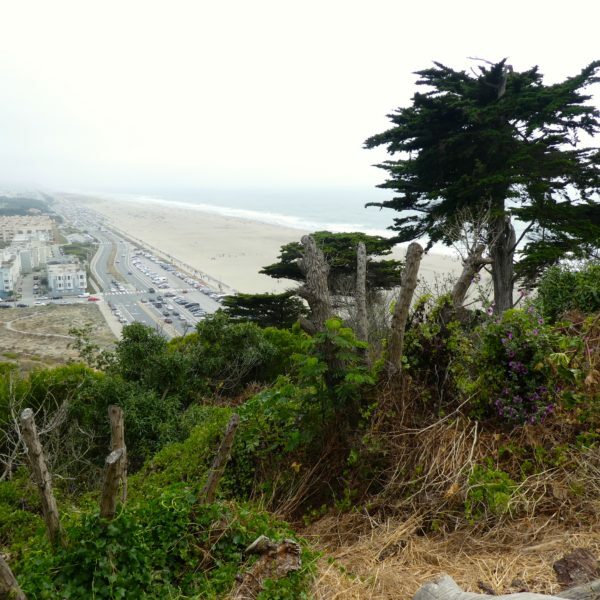 Take the time to walk along the blocks bordering Sutro Heights park. 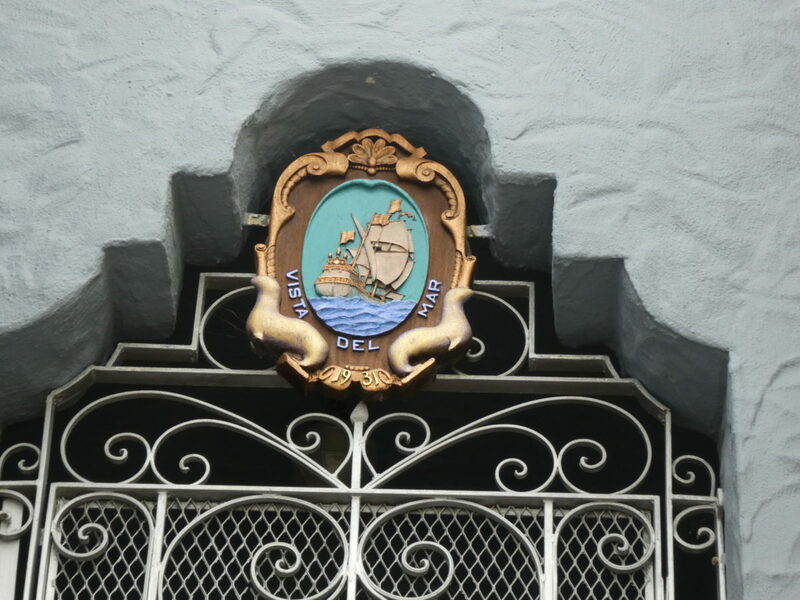 At the southwest corner of 47th and Geary, one home still bears the crest of “Vista del Mar Estates, 1931.” It was one of the model homes the original buyers were invited to tour. 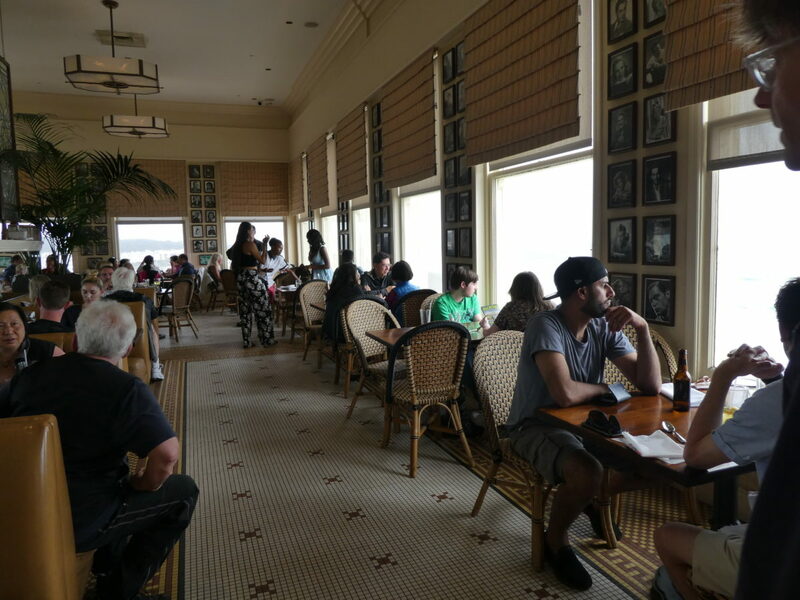 Although the splendor of the Sutro mansion is long gone, the founders of the Cliff House and other local businesses have faithfully restored and updated the interiors of their townhouses in the area. 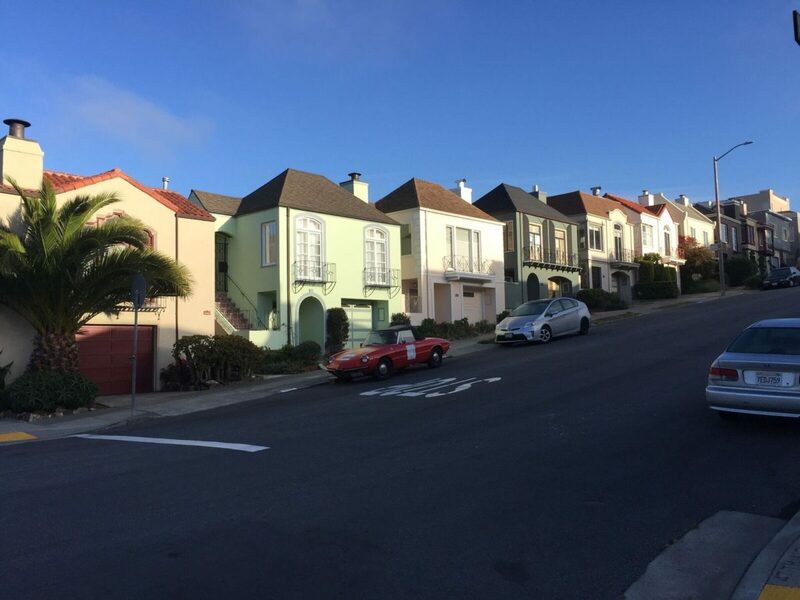 The houses lining the West side of 47th Avenue have been nicknamed “the Nine Painted Ladies” of Sutro Heights, counterparts of the more famous Victorians on Alamo Square. 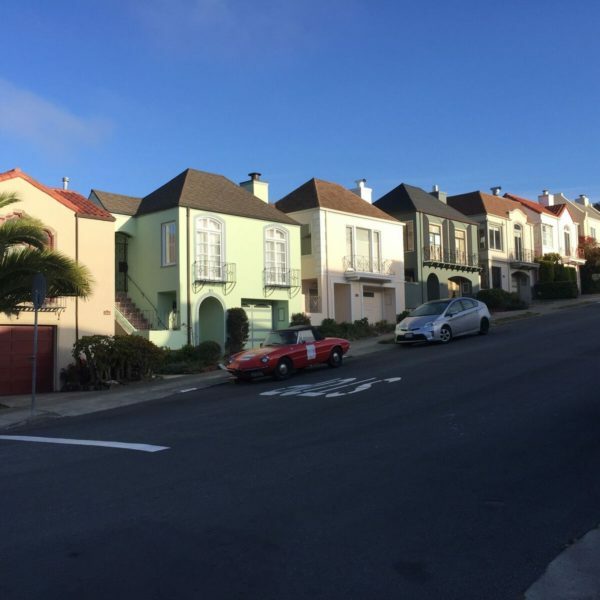 Tech titans hoping to turn these classics into mega-mansions have run up against a united front of neighbors determined not to have extra stories or additions spoil the symmetry of the architecture. Each house seems to have a personality of its own. 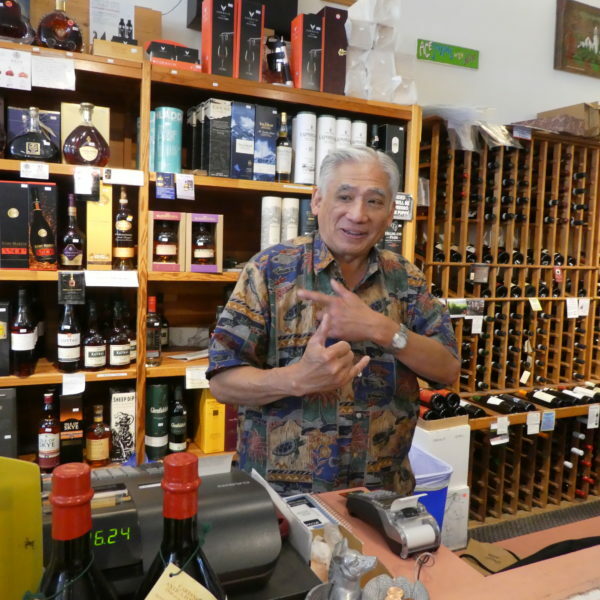 Past residents have included one of the Mitchell Brothers, who made their fortunes from San Francisco’s infamous X-rated O’Farrell Theater. Just to the south along the coastline, the former location of Playland at the Beach has been replaced by condos and townhomes. The amusement park closed in 1972 and fell into seedy disrepair until developers moved in. 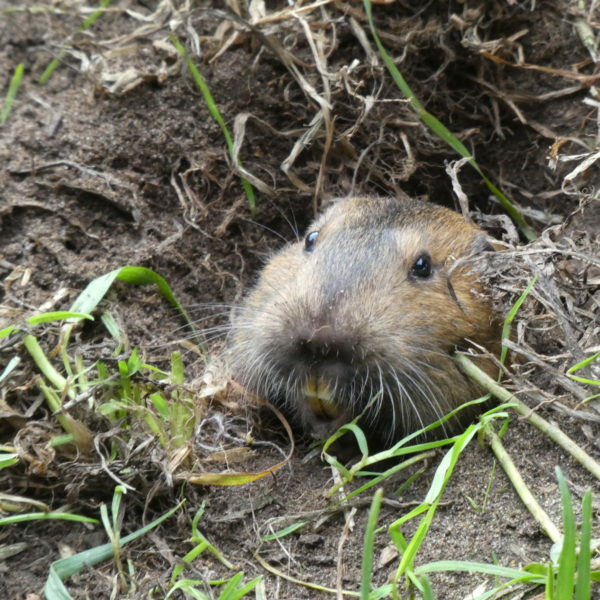 The neighborhood coalition succeeded in preserving a land parcel at the foot of Sutro Heights Park as natural habitat. 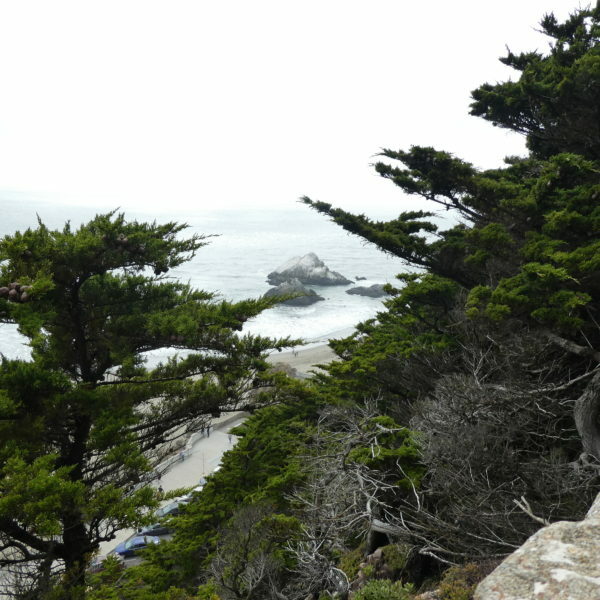 The official National Park Service map warns that swimming on Ocean Beach is NOT recommended, due to strong currents and frigid water temperatures. That doesn’t stop lots of people from spreading out their picnic blankets on the sand. 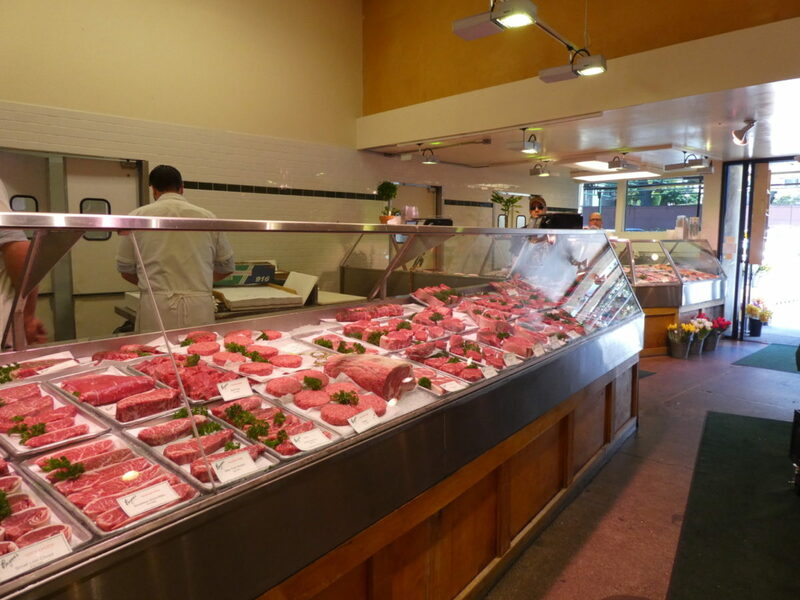 One thing the neighborhood lacks is a real shopping and restaurant district. 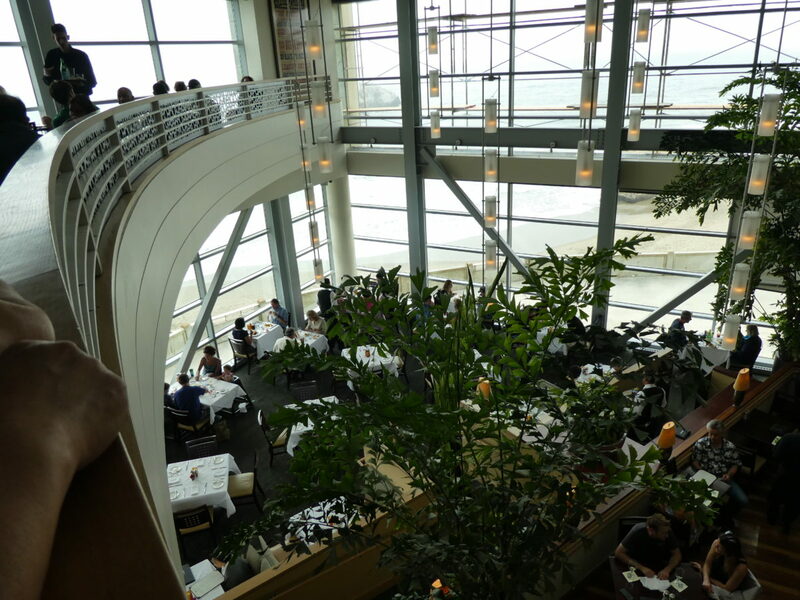 The Cliff House has long been a favorite for special occasions, with fine dining and more casual options to go along with the splendid view of Seal Rock. 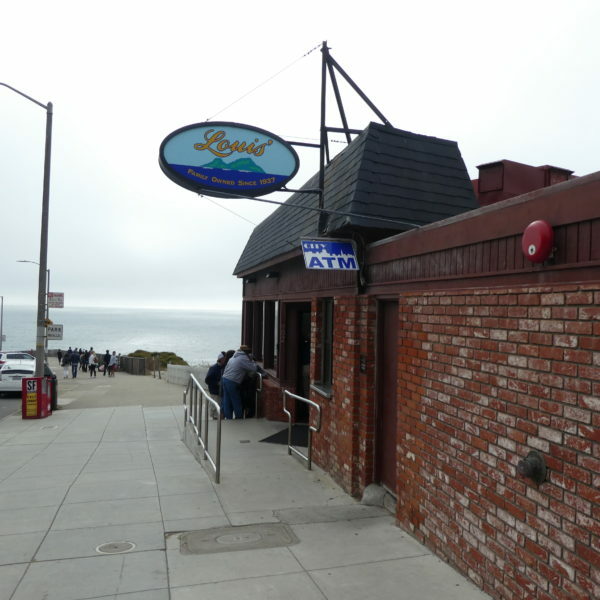 There’s a bit of rivalry with the owners of Louis’, a decidedly less elegant diner overlooking the Sutro baths. Bring cash. 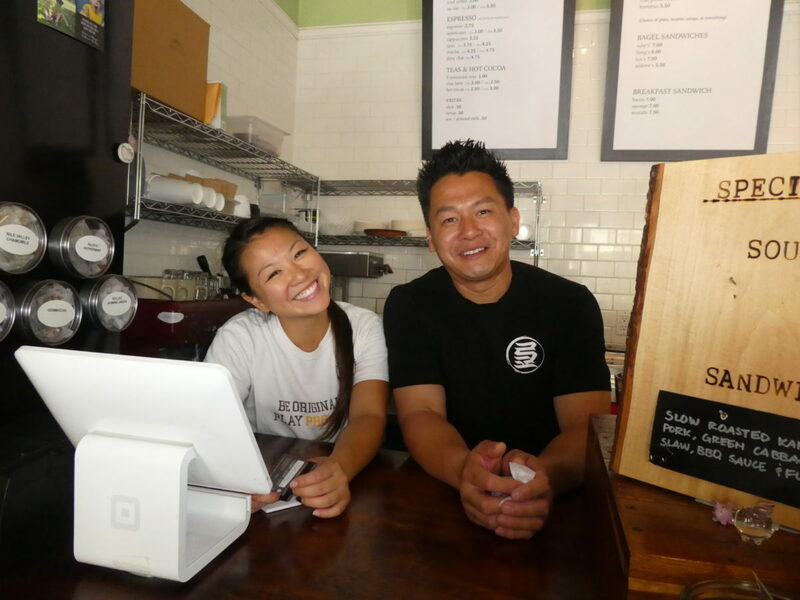 The sign boasts that the small restaurant has not accepted credit cards since its founding in 1937. 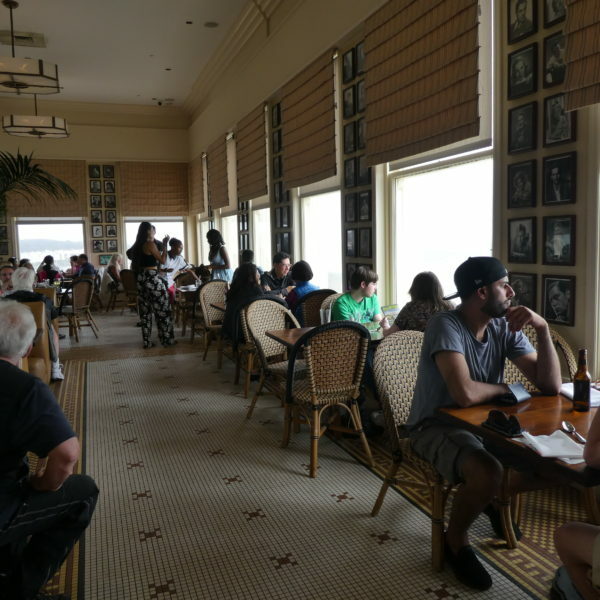 Both rival restaurants are good choices for breakfast with a view. 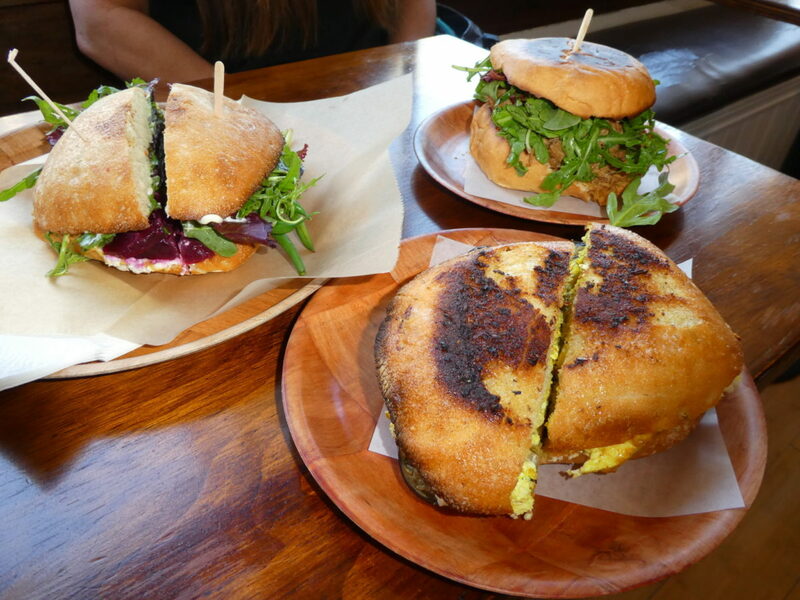 To find more options, venture through Golden Gate Park to the Sunset District for restaurants that are popular with locals. 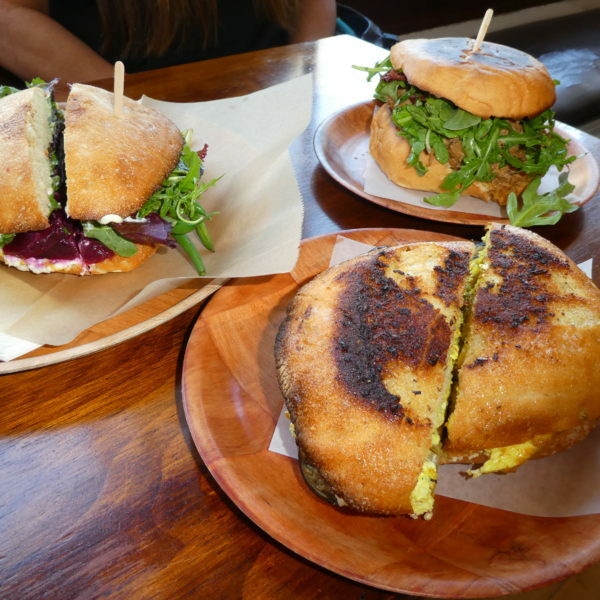 Expensive dining choices are everywhere in San Francisco, but at a family-run neighborhood haunt like the Wooly Pig you can have a tasty lunch of Vietnamese banh-mi inspired sandwiches They’re famous for their pulled pork, but vegetarians will also find options, all served up with a smile. 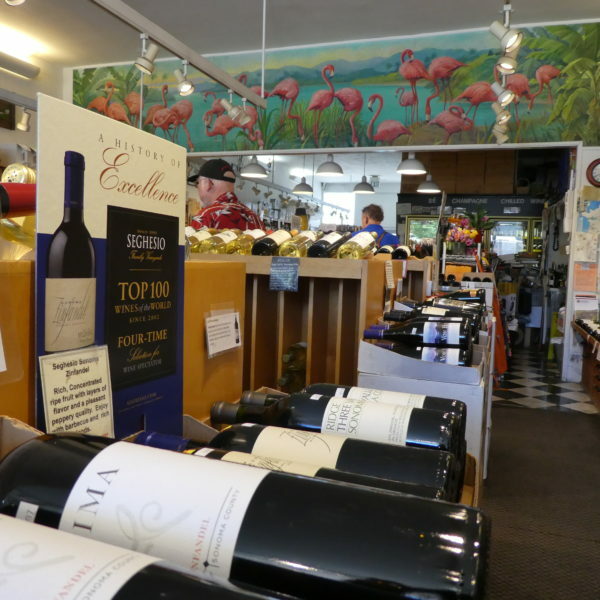 If you don’t have time to get to the wine region, you can find the best of California vintages at Wine Impression on California Street in Laurel Village. 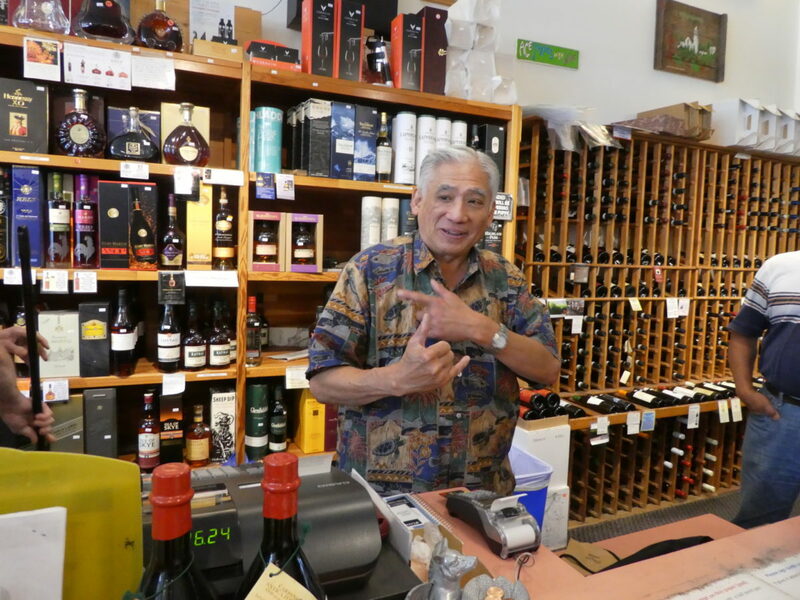 Raymond, one of the partners who’ve been selling wine here for 27 years, will help you find a bottle that exactly suits your taste. 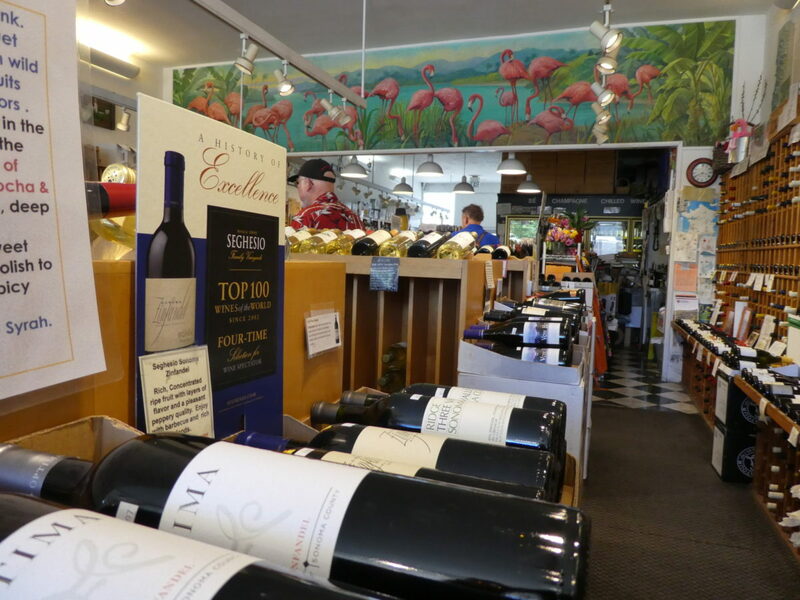 The flamingo mural dates back to the original shop in 1949. 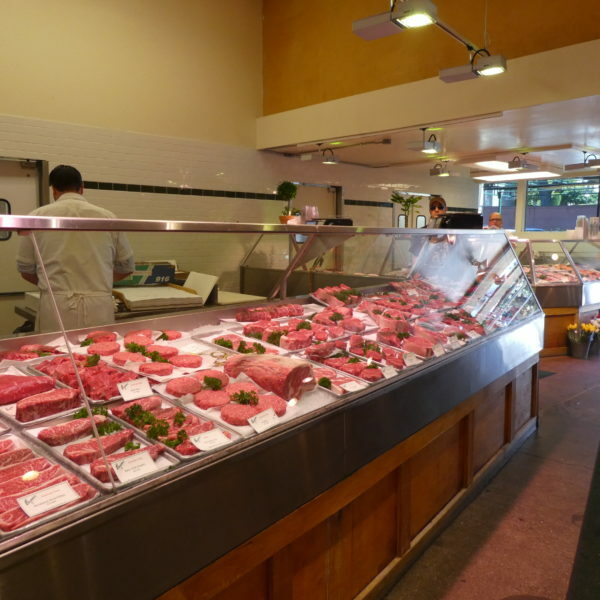 If you’ve ever wondered where tech zillionaires shop, it’s probably along this row of essential shops where the produce, meat and fish on display at Bryan’s look too perfect to be real. 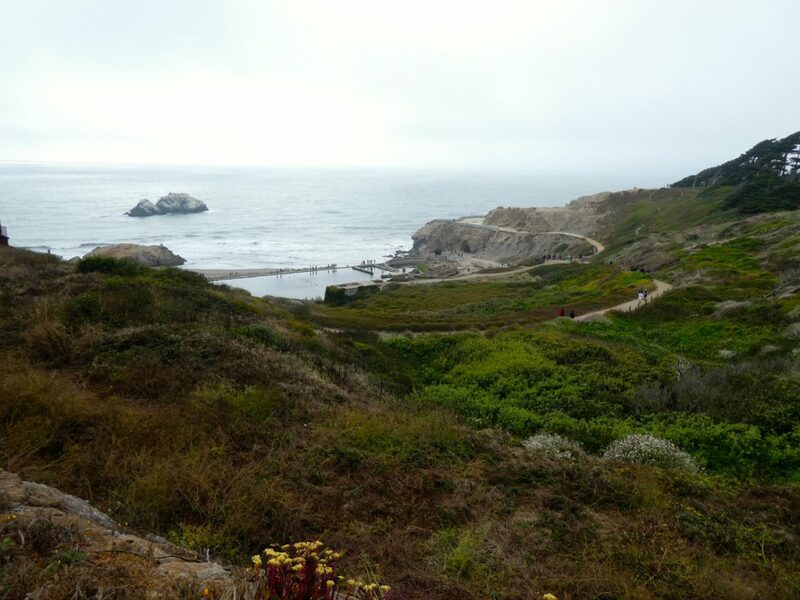 The perfect ending to your day in Sutro Heights is a stroll along the path that begins near the Lands End lookout, at the corner of 48th and Point Lobos Avenues, and winds around the cliffs for a spectacular view of the Golden Gate bridge. Don’t forget your to count your steps. 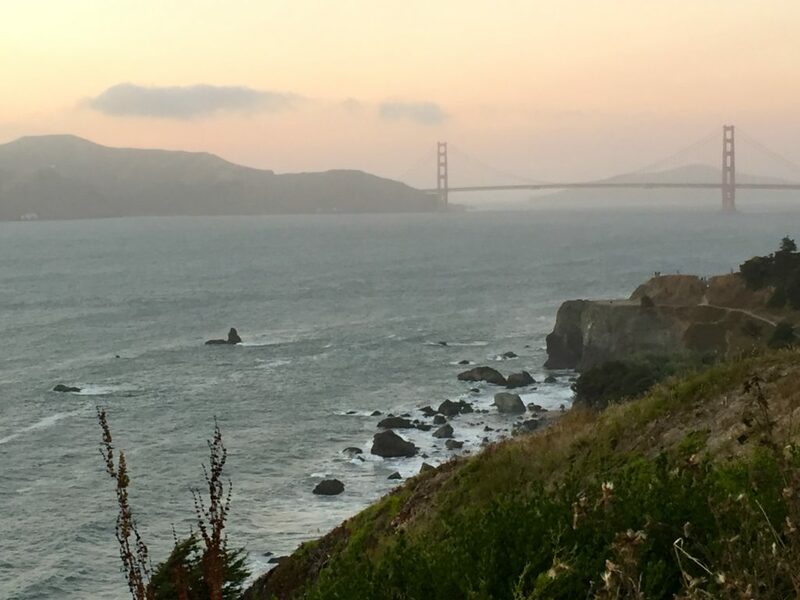 A million dollar view of the Golden Gate — absolutely free. 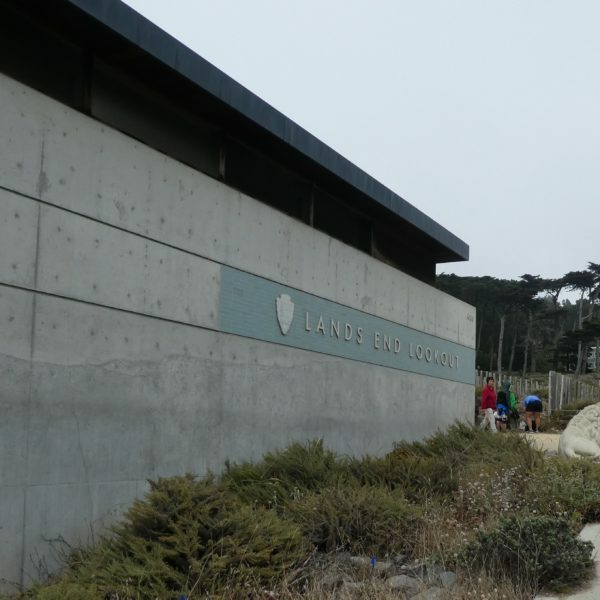 Stranger Danger: Parking at the Lands End lookout area is free, but it comes with posted warning signs. 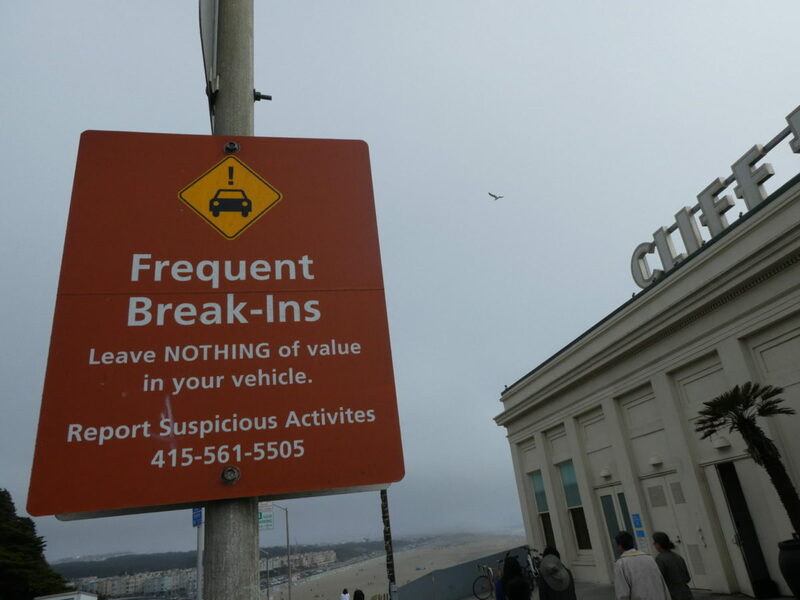 Do NOT leave anything of value in plain sight in your car. 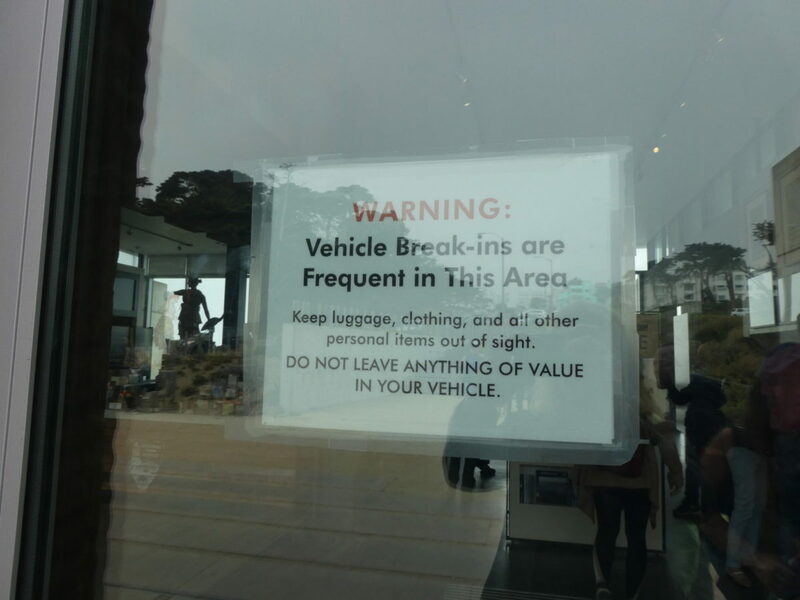 Even if the car is locked, you may be the target of smash-and-grab robbers. 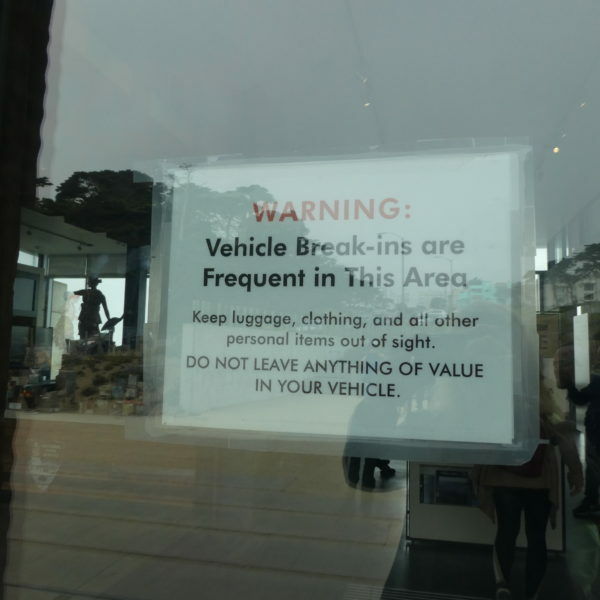 Secure any valuables in the trunk. Getting here: A safer choice may be taking the bus. 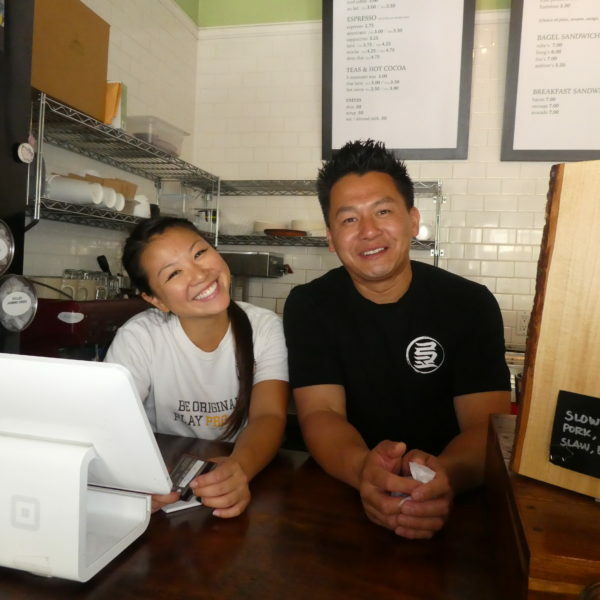 Route 38 R comes from the Financial District along the ever-changing panorama of Geary Street to the end of the line at Sutro Heights in as little as 35 minutes. Bus fare is $2.50 if you have a Clipper card, $2.75 in cash. CityPASS offers three days of public transportation (including cable cars!) plus reduced admission to many attractions. 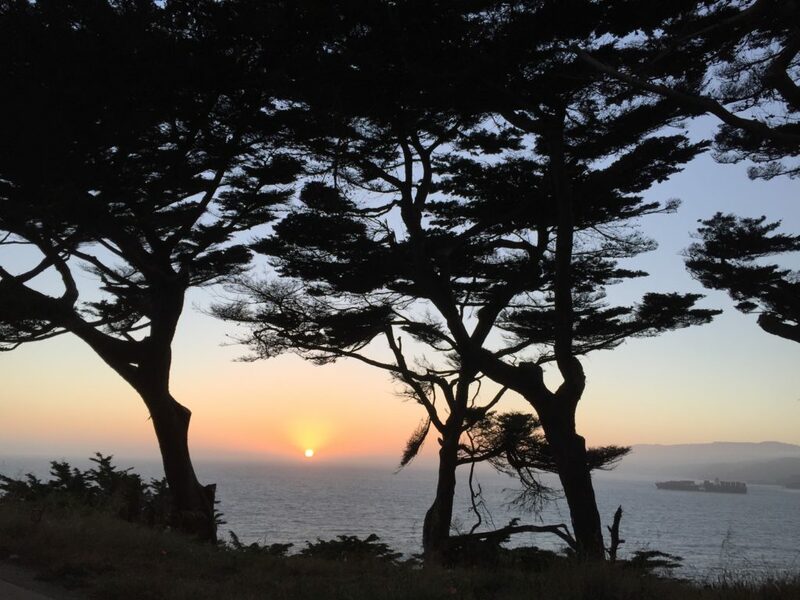 A peaceful ending to your day in Sutro Heights. Staying here: The bus stop is right across the street from the Seal Rock Inn, an atmospheric hotel that seems not to know the 70s are over. 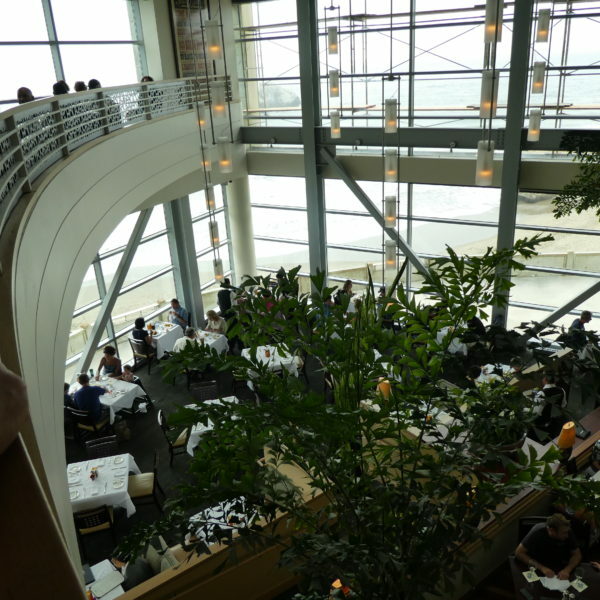 The rooms are hip and funky, and even if you don’t stay here, the restaurant serves up basic comfort food at reasonable prices. 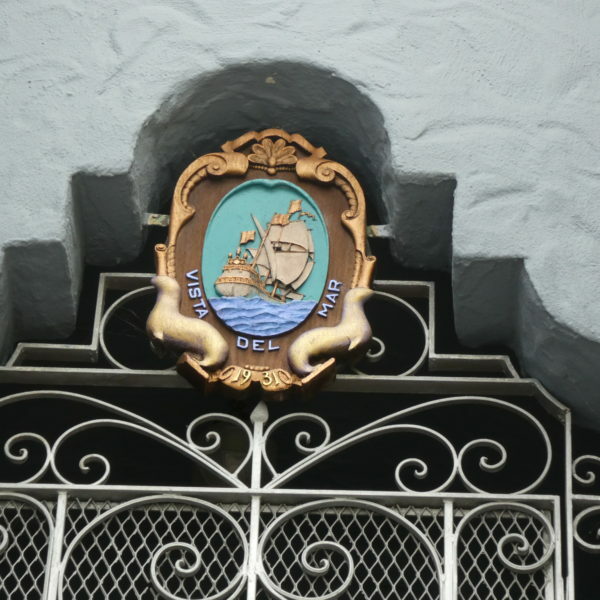 Some visitors enjoy making this seaside neighborhood their home base and taking the bus into the heart of the city. AirBNB is a more controversial option. The idea of welcoming strangers has somewhat divided the neighbors, especially if some of the paying guests are a little too rowdy. 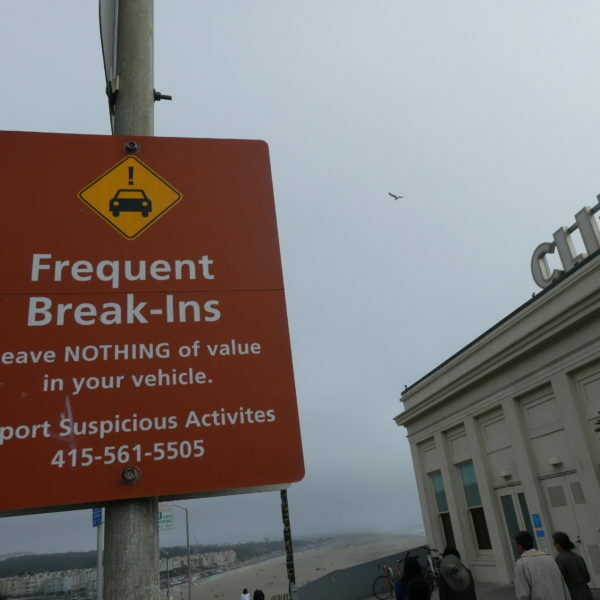 So if you choose a nightly rental, respect the area’s peace and quiet. 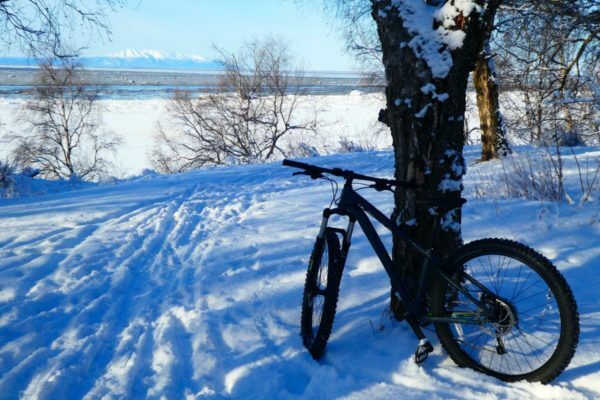 Click here to set up your Airbnb account with a discount.